Kanban is a method used to manage production systems and which began as an approach to lean manufacturing. Lean involves reducing waste and introducing improvements for greater efficiency. Kanban is a method used to manage production systems and began as an approach to lean manufacturing. Lean involves reducing waste and introducing improvements for greater efficiency. Kanban uses a visual board with cards that denote demands and capacities, roles, and other elements of workflow processes. Kanban allows companies to employ just-in-time (JIT) manufacturing concepts where production is geared to meet the demand, so any surplus in anticipation of demand is efficiently eliminated. JIT as a goal relies on the more precise flow of materials and resources to meet, and not exceed, the upper limits of operational capabilities. One of the Kanban method's chief benefits is that it can determine and track limitations on the work in progress. This helps regulate inventory and prevent over-scheduling, which might otherwise lead to shortages or delays. Kanban has proven to be a flexible methodology that can be applied to any number of industries and processes. The Kanban methodology offers a streamlined approach to human-based systems as well as machine-based manufacturing. This includes developmental pursuits such as software, technology, multimedia, and eLearning solutions. Tasks are pulled into the system based on balancing demand with capacity, rather than pushed, to ease the impact of system bottlenecks. Items involved in the workflow are visualized on a physical or digital board, so all team members can quickly evaluate process flow and estimate progress. Kanban can also work in tandem with other methodologies, such as Agile or iterative development. Deploying and maintaining Kanban boards within your organization requires no special knowledge of any other methodology to attain success. In eLearning projects, this visual management tool helps to facilitate progress by clearly identifying what must be done, in what sequence, and how much activity is required. It serves as both a communication and collaboration tool that can be organized in any way you prefer and easily updated to reflect changes or new demands. Kanban is still widely used in manufacturing environments around the world, particularly the automotive industry where it originated. It was developed in the 1940's as the brainchild of Taiichi Ohno, an engineer with the Toyota Motor Company, and soon revolutionized the problems of effective task scheduling and incremental boosts to efficiency. The original system involved production employees and material suppliers using "Kanban", or cards, to signal when they were ready to take on more work. To Do - a prioritized list of tasks that can easily be re-structured as circumstances change. In Progress - Kanban limits the 'In Progress' capacity to 3 items to focus efforts. Completed – Overview of what has been finished. The level of detail in any of the 3 areas can be as complex or as generalized as necessary for top-down or bottom-up perspectives for different teams. Additions to the 'To Do list' can only be promoted to 'Work in Progress' when 1 of the 3 objects of focus is finished and moved to'Completed'. Team members can easily and quickly check on the status or requirements of only those activities that directly concern them. This makes it much faster and easier to stay informed and focused on day-to-day requirements, while also seeing the big picture. Organizing a process on the Kanban board helps employees concentrate on their tasks while providing visibility into the overall workflow. This helps managers and supervisors make more timely and effective decisions. It also provides a sense of teamwork across the whole process from start to finish. By providing your whole team with a comprehensive plan of action, Kanban also improves workflow as a form of communication. There's a reduced need for discussions of strategy or daily progress meetings. All the planning and work done in real time is easily accessible, so more time and energy can be spent on completion of tasks. It also reduces wasted time and costs in development projects as well as in manufacturing. Team members can see at a glance who is handling which responsibilities, what they need, and how far they've progressed. This significantly reduces the chances of duplicated efforts or poor allocation of resources. Each card on the board represents a task, including demands, timeframes, and to whom the task is delegated. As results or obstacles occur they can be reflected in the board for immediate communication with the participants. This helps team members react faster to new factors, such as increased demand or changes in priority. No matter what adjustments need to be made, team leaders can immediately evaluate the impact on costs, time, materials, labor, and future progress. The board streamlines identification and communication of new issues so teams can concentrate on what's currently important. This can ensure compliance with expectations of both productivity and quality. In development work, these tasks will include testing and, depending on the nature of your operations, client approval. 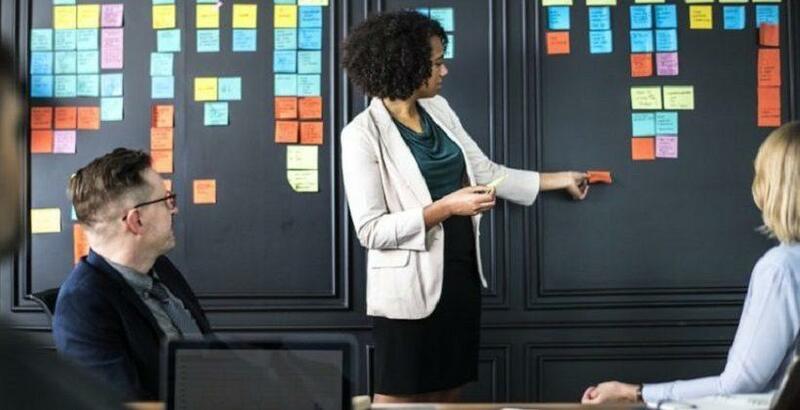 By using the principals of Kanban boards to implement and monitor requirements and quality assurance tasks, high levels of performance and exacting standards can be maintained to ensure greater satisfaction from customers and end-users. Kanban is a visual methodology that empowers you and your team with a flexible, intuitive resource to coordinate your efforts. It's ideal for eLearning environments in that it can provide transparency into every stage of the development process for a smoother workflow and consistent quality. The Kanban approach is a versatile tool for ongoing development amid increasing demand for more specialized eLearning applications. Best of all, it allows you to identify areas for improvement and track changes for continuous benefits to your bottom line.